46 km (29 miles) to the east-southeast of Phuket, the Phi Phi Islands group has been drawing visitors from all four corners pf the globe for over a decade. The Phi Phi Islands group are one of Southeast Asia’s most striking destinations. Verdant limestone hills rising out of turquoise waters are the first impression that Ton Sai Bay in Ko Phi Phi Don, the main island, gives to newly-arrived travelers. The craggy majesty of Ko Phi Phi Leh provides a marked contrast while peripheral islands offer a heady cocktail of white-sand beaches, nodding palms, crystal-clear water and superb scuba diving, snorkeling and fun dive activities. Scuba diving day trips, snorkeling and fun dive at Ko Phi Phi Islands offers a splendid variety of different types of diving on its local reefs, with abundant hard and soft corals and a rich diversity of marine life – suitable for all scuba diving levels. Snorkeling day trips around Phi Phi Island is second to none, with plenty of shallow coral gardens crowning the fringing reefs, which are alive with colorful fishes. Phi Phi Islands Diving – Ko Bida Nok is boosting a remarkably dramatic underwater topography and is characterized by steep precipices, caves, swim through and underwater crags. It is no wonder that Ko Bida Nok and its sister island Ko Bida Nai are two of the most popular dive sites in the Phi Phi Islands! There is a small underwater bay at the southern side of the island made up of reef slope and rocky floor that starts at 6 to 8 meters ( 26 feet) and ends in a sandy bottom at 20 meters (66 feet). A vertical swim through at the southwest side of the island, beautifully illuminated by surface light, is not to be missed. Divers with Cavern specialty may also want to check out a narrow cave on the northern side of the island. The cave’s entrance is at 20 meters (66 feet) and the wall is covered with colorful and soft corals and gorgonians. 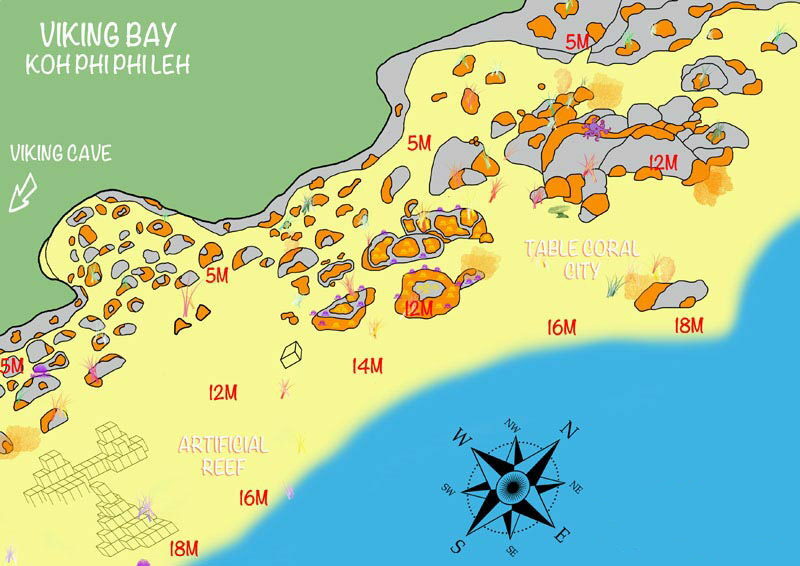 Outcrops of various sizes are scattered along the west coast, sloping down to depths of 26-30 meters (100 feet), while the east coast is a reef slope with a mixture of hard and soft corals and small outcrops. Leopard and black tip reef sharks may sometimes be found along the reef line. Kuhl’s stingrays are common in the area, and look out for small bamboo sharks hiding in the cracks. Look to the blue beyond the reef and you may also see schools of pickhandle barracuda. Along the reef, you will find also a variety of colorful reef fish, such as puffer fish, porcupine fish and lion fish. Macro lovers should also keep a sharp lookout for ornate ghost pipefish, seahorses and nudibranchs. Phi Phi Islands diving – Ko Bida Nai has an amazing topography of underwater crevices, huge boulders and field of staghorn reef. Stretched across the south and west coast of the island, is a gradual reef slope that starts at a depth of 6 to 8 meters (26 feet) and is made up of hard corals like pore corals, table corals and staghorn corals. There are also some big boulders and a swim through on the southern side. The topography on the northern side of the island consist mostly of stunning crags and cliffs, with walls dropping vertically to a depths of 28-30 meters (100 feet) before hitting the sandy bottom. In this section, there are soft corals, sea fans and lots of huge barrel sponge. Leopard sharks are quite common here, especially on the eastern side of Ko Bida Nai. Black tip reef sharks have been known to make appearances in the area. Divers may also spot and dive with sea turtles. Schools of barracuda and trevally are often sighted near the east pinnacle as are snappers and mackerel. Scuba divers may also see cuttlefish, honeycomb moray eels, sea snake and Kuhl’s stingrays. Macro species such a ghost pipefish, nudibranchs and porcelain crabs are also frequently sighted. Palong Bay is a wall dive situated on the west side of Phi Phi Leh Island. It is an ideal dive site for student and fun divers, affording varying depths along the wall and a sheltered environment. Palong bay is made up with massive limestone boulders breaking the surface and descending to 18m. The steep wall drops to a sandy sea-bed that is littered with smaller rocks. Navigating the site is usually done along the shallower depths of the wall. Palong Bay has a good variety of soft corals. Feather stars adorn sea fans that reach out from the many rocks. The highest interest of this dive site is the encounters with a dozen of black tip sharks and sometimes leopard sharks. Dolphins have also been regularly spotted in this bay. Scuba diving at Maya Garden is a swim through haven of strewn limestone boulders than have fallen from the massive cliff rise of Phi Phi Leh. It is accessed by mooring in the northern end of Ao Maya. The cliff walls gently slope to the sea-bed at 18m. The fallen boulders offer a labyrinth of tunnels and swim throughs as you progress along the wall. The sea-bed is a sandy carpet with many rocks. Of the common visitors and dwellers to Coral Garden perhaps the most favored is the hawks-bill turtle. Often seen on this dive site, at mid-water feeding on anemones, it is a welcome distraction to many trevally, parrotfish and scorpionfish. Coral life includes soft corals, barrel sponges and sea fans that grow from the boulder walls. Loh Samah is a fantastic and relaxing scuba dive with much to explore and see. This dive site is also appreciated the student scuba divers. The topography of Loh Samah is very varied. The slope at the edge of the bay’s entrance rises sharply to the start of the dive site at 10 meters (33 feet). The karst in the middle of the bay leads you along its wall out of the bay and around to the canyon. The 14 meters (46 feet) valley is formed between the karst and a very large submerged rock. Follow the karst all the way around back into the bay, under overhangs, until the sea-bed rises back to 10 meters (33 feet). Marine-Life: Loh Samah is a feast for the eyes. The wall of the karst has barrel sponges, minor-size hard corals and scattered orange sea-fans. The bay’s central formations are mostly branching and brain corals. Leopard sharks have been glimpsed at the front of the karst at 8 meters (25 feet) and there are bannerfish, morays, batfish, barracuda, scorpionfish, lobsters and sea snakes common in this bay. All 4 Diving – For all your Phuket diving needs.